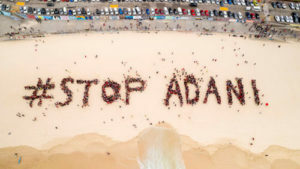 On Saturday concerned citizens around Australia turned out in their thousands to spell it out for the Federal and Queensland governments: the community is strongly against Adani’s Carmichael dirty Galilee Basin coal plans. 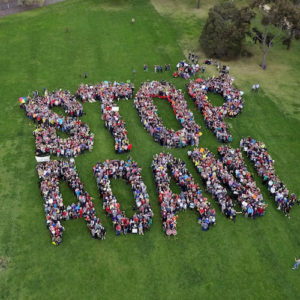 Market Forces campaigners Matt and Pablo were at the Melbourne event, where over two thousand people demonstrated their opposition to Adani’s environmentally disastrous agenda. It was an amazing day, and the sun decided to shine bright for the occasion, bringing light and energy to the campaign to stop a massive roadblock to a sustainable future for Australia and the world. 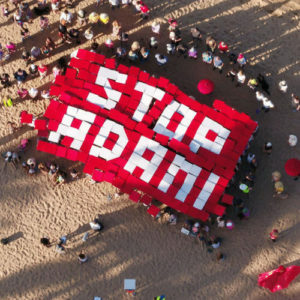 Find out how you can get involved in the campaign to #StopAdani! 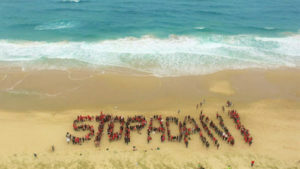 Groups across the #StopAdani Alliance were present including 350.org, GetUp!, the Australian Conservation Foundation, new member Sea Shepherd, the Australian Youth Climate Coalition and Seed Mob. 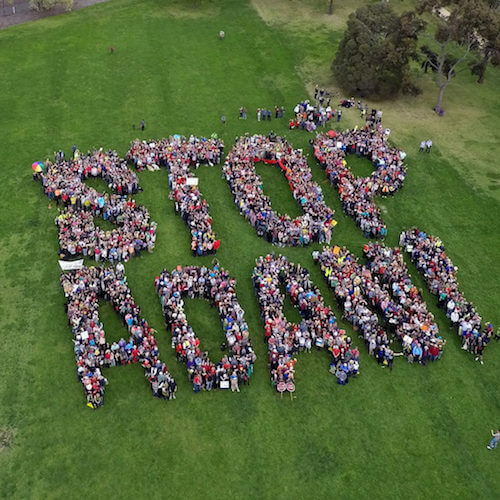 Grassroots activists across Melbourne and Victoria also made the trip accompanied with signs, placards, songs and an unshakeable motivation to #StopAdani. The Melbourne sign was a massive success and was featured in the Sunday Age, as well as the Project on Channel 10. 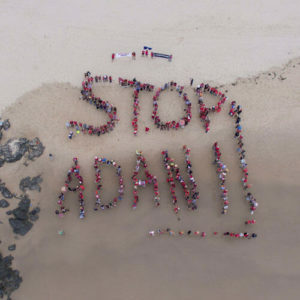 This has been a massive week for the #Stop Adani campaign, following on from a shocking expose on Adani’s track record on tax avoidance, rampant environmental destruction, social dislocation in India and shady corporate dealings last Monday on ABC’s Four Corners. There were signs in 45 places across Australia, all of the capital cities (2 in Sydney!) and across regional centres as well as towns in Northern Queensland including Mackay and Townsville. In you didn’t get a chance to go, take a look at some of the incredible photos taken. A new poll has also been released, showing that 56.6 % of people are opposed to the mine going ahead, and 65.8 % want the Queensland government to veto the taxpayer loan Adani needs to build its rail line. These statistics back up what we’ve known all along, that the community is rising up for a sustainable economy for Queensland despite the efforts of Adani and their cheer squad in the Liberal, National and Labor parties to falsely present coal as the only path to development in the north. Market Forces has been working hard on this campaign to ensure that corporations steer clear of Adani’s project. 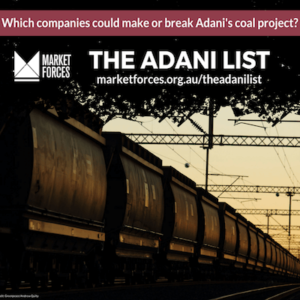 Check out our Adani List to see find out companies could make or break the Carmichael coal project and take action. 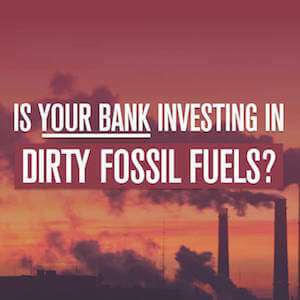 On the 1st of November we are organising a tour of Melbourne where we will speak about companies on our very own doorstep who think they can get away with working with Adani on the biggest new coal mine in the world. We will meet at 11:45am at Collins Place, the home of FIIG securities, a company desperately working to help Adani get refinance on their coal port at Abbot Point, and we will end at Collins Square, where the offices of AECOM are located, the international engineering firm which hopes to build a railway line between the mine and the port and transport some of the dirtiest coal in the world. From there we will walk the the Melbourne Convention Centre, where we will join Quit Coal and rally outside the International Mining Conference, where Jeyakumar “JJ” Janakaraj, the CEO on Adani Australia will be speaking! 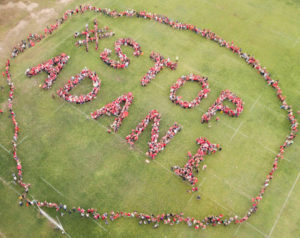 It will be an amazing day to show how strongly Melbournians feel about stopping Adani! Will you join us on November 1?